They brought him in that afternoon. His chainsaw had hit a snag and leapt from his hands, slicing through one side of his nose, mouth, throat and chest. “I tried to jump clear,” he mumbled through the blood. “Not fast enough.” He managed to sound rueful and apologetic at the same time. At the Canadian federal nursing station at Tatla Lake, deep in the Chilcotin country of British Columbia, the resident nurse called for the forestry helicopter and loaded the injured man aboard. The chopper pilot quickly got them in the air, bound for the nearest hospital at Bella Coola on the west coast. En route to Bella Coola the nurse, a striking redhead named June Hooper, attended to her badly injured patient. She exuded calm control. A scam. Nurse Hooper was a young American girl who just a few months earlier had earned her master’s degree in nursing at the University of Washington. Nobody there told her there would be days like this. None of her anxieties showed. Only her solicitude. She learned that the man’s name was Olaf Satre. He was 74 years old. He owned a 1,100-acre ranch and 300 head of cattle and a herd of family members and domestic found-ins. Olaf had built his own log house. So he knew how to use a chainsaw. But this time it had gone wrong and he’d lost a lot of blood. His ribs showed where the bucking saw had torn the flesh away. Olaf Satre said nothing. It’s hard to talk when somebody is sewing stitches into your torn lips. Anyone making his first trip to the Chilcotin/Cariboo country in the British Columbia interior, as I was doing that year, had better understand the ground rules going in. The last stop of any consequence is Williams Lake – a frontier town in most lexicons but the nearest thing to a metropolis in the Chilcotin. When you depart Williams Lake headed west, your trip gets even more interesting. The way guerilla warfare is interesting. The pavement ends a hundred miles farther on. It signals your arrival in Alexis Creek. Alexis Creek is not a town. Or even a village. It’s two gas pumps and a tavern. As you continue west from there, life as you know it is reduced to glorified logging roads topped with loose and dangerous gravel. And yet every hour of the drive is incredibly scenic. For hundreds of rock-strewn, potholed miles, all you see are magnificent mountain ranges sloping into emerald lakes and rivers. Cattle herds graze in distant meadows. A deer meanders by, an eagle plunges toward an unseen prey. Do not, however, dawdle over the scenery. Nobody else does. While the population density of the Chilcotin may be roughly one human per 100 square miles, they’re all armed with SUVs and pickup trucks operated at thunderous speeds. Whenever one barrels past, the gravel fusillade hitting your vehicle sounds like a bad day on the Gaza Strip. Eventually you arrive at a wide spot in the road called Tatla Lake (human population: 186). In season Tatla Lake is a magnet for hunters and fishers; now, in early fall, its single restaurant survives on “local” traffic from ranchers within a 90-mile radius. This is where I meet Harry Haynes, a laconic septuagenarian who is the friend of a friend. Harry invites me to visit his nearby ranch – nearby being a mere 46 miles from town. Two days later, in sore need of a change of vistas, I am pulling up a chair in Harry’s kitchen. Harry says he doesn’t get a lot of visitors out here. Or visit a whole lot himself. He tries to recall the last time he ventured outside the Chilcotin, and draws a blank. No need to travel “outside” anyways, he says. You see one of them cities you’ve seen ‘em all. No, I say. Definitely not hunting season. I tell him I’ll take an interest in hunting when I find a way to run guns to the animals. Harry Haynes sits and nods, and says nothing. In the Chilcotin, they make allowances for quirky types. Which, by definition, are city types. The emergency room doctor in Bella Coola tells Nurse June Hooper he put “somewhere near a hundred” stitches into Olaf Satre’s head and body. She winces. Will Olaf be all right? Oh, sure. She looks around for her patient, but Olaf has left the hospital. He stands waiting for her out by the chopper pad. Olaf is adding a room to his log house, he explains. He’s anxious to get home and get the doors hung before snowfall. Next day, when Nurse Hooper does a follow-up call to Olaf’s ranch, she invites me along. Perhaps because I’m a writer, or because she married me once and feels an obligation. Or because I might hyperventilate if I spend another day reading week-old newspapers in Tatla Lake’s only restaurant. Olaf sees us approach along the mile-long driveway. He drops his tools and hurries to the federal vehicle and greets us warmly. He is delighted to see June again, but he apologizes to her through his stitched lips. Man wasn’t thinking – he was too busy bleeding. His lapse of gallantry troubles him. Olaf is 74 years old and runs an 1,100-acre ranch with 300 head of cattle and pretty much creates what he needs with his hands. He doesn’t need much. Or ask much. But he had been a bother. And when a pretty and resourceful nurse came to his rescue, he wasn’t as hospitable as he should have been. Watching him make his apologies to Nurse Hooper, I began to understand the hardy few who live and thrive in remote outposts like the Chilcotin. Olaf Satre and Harry Haynes are throwbacks – holdovers from a time when self-reliance and individualism broke trail for civilization. Then when civilization went one way, Olaf and Harry went another. Olaf will have those doors hung by now. Harry may even have his TV fixed. They know each other, of course. Run across each other in Tatla Lake at least once a year, arriving from different points of the compass. In Chilcotin terms, they’re neighbors – a mere 64 miles separates their log houses. And like any neighbors, they know they can count on each other. That should be civilization enough for anyone. The North Potatoes region in the Chilcotin. 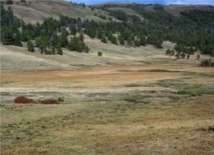 Ranch land in the Chilcotin.